The Fat Man embodied the beat and pulse of blacks’ music. An entertainment legend all the race can be proud of, Fats Domino was a musical genius and R&B and rock ‘n’ roll marvel that sold millions of records during his lifetime. “Black” from roots to demeanor, Fats dominated record sales and radio plays during his time.. Domino’s personality and music broke through racial prejudice of the-segregated era with hits such as “The Fat Man” (1949) and “Ain’t That A Shame” (1955). The Fat Man made music for generations. For sixty years, Domino’s sound was instantly recognizable, its uniqueness was aided by sharp sidemen. Domino ruled over early rock for decades. Unlike many black artists exploited by record companies, Domino opted for contracts that paid him royalties based on sales of records. He was one of the first black artists on national television in the 50s, and toured widely in Alan Freed’s rock and roll package shows. 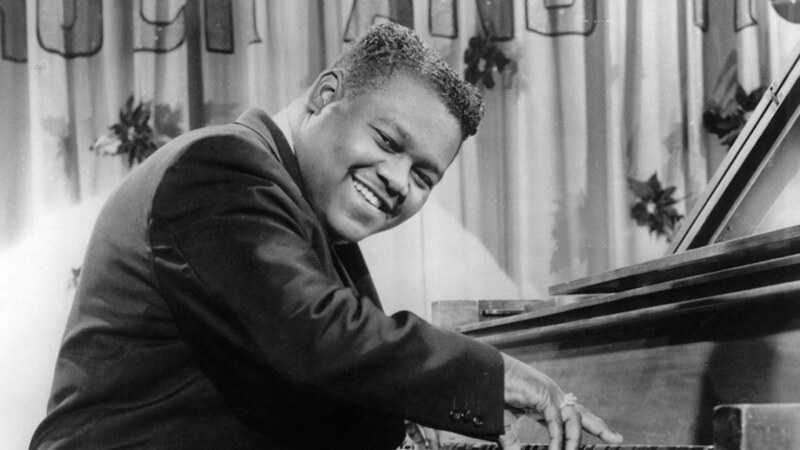 The Fat Man was born Antoine Dominique “Fats” Domino, Jr. a name wonderfully evocative of his home town’s Creole ethnicity. Antoine Domino was born Feb. 26, 1928, the youngest of eight children in a family with Creole roots. Through his life Fats resided in New Orleans’ Ninth Ward. The Fat Man is a cultural icon from a cultural icon. New Orleans is a major influence on Black culture. New Orleans is a Louisiana port-city nicknamed the “Big Easy,” for its round-the-clock nightlife, live-music scene and cuisine reflecting its history as a melting pot of French, African and American cultures. Fats’ population of African Americans included Creoles descended from unions of Africans with French and Spanish. The Creoles often were labeled as “gens de couleur libres” (free people of color). Fats was urbane and country, all at the same time. Domino grew up and evolved in New Orleans’ 9th Ward. The 9th Ward is located in the easternmost downriver portion of the city and geographically the largest of the city’s seventeen Wards. Music filled Fats’ life from the age of 10, when his family inherited an old piano. His was a large, musical family of nine children. His love with the piano began at a very young age. Domino taught himself to play. He loved all the popular styles of music: boogie, ragtime, and blues. Domino left school at 14 to focus on music taking on odd jobs like factory work and hauling ice. In 1947 Domino married Rosemary Hall, and they had eight children, Antoine III, Anatole, Andre, Antonio, Antoinette, Andrea, Anola and Adonica. Rosemary passed in 2008. Fats Domino began his music career in 1947. Life was good for Fats. By 1949 he was a big draw around town. In his most profitable years, Fat had sold 65 million singles along with 23 gold records, second only to Elvis Presley as a commercial force. In his career Domino sold over 100 million records. Fats net worth at death exceeded $8 million. Fats was ideally marketable, with his relentless left hand, Domino brought a propulsive rhythm that differed from other R&B His influence in the music scene during the 1960s and 1970s made him a music icon. A major chunk of his earnings were through the royalties from each hit. Fats gave up touring as a source of revenue in the 1970s. He had toured Europe for the first time in 1962 and met the Beatles in Liverpool, before they were famous. Like Ray Charles, Domino too was a tour-de-force and “headliner” performing worldwide. . In the mid-sixties Fats appeared for 10 months a year in Las Vegas. On tour, he would bring his own pots and pans so he could cook. That ended in the early 1980s, when he decided that he did not want to leave New Orleans. In recent years, Fats was seen driving a pink Cadillac around New Orleans, after having emerged from his pink-roofed mansion. Fats regularly sported a white ship captain’s cap, with a fair splash of gold jewelry about his person. Ernest Evans’ stage name ”Chubby Checker,” was a word play on the Fats Domino persona. Hey Buddy!, I found this information for you: "Business Exchange: The Fat Man". Here is the website link: https://blackmeninamerica.com/business-exchange-the-fat-man/. Thank you.